Would you like an elegant deck? Does Your Deck Need A Facelift? Composite Deck with Cedar Rails! While there are many decks out there that are a single color or tone, many home owners enjoy the elegance of the two tone deck. 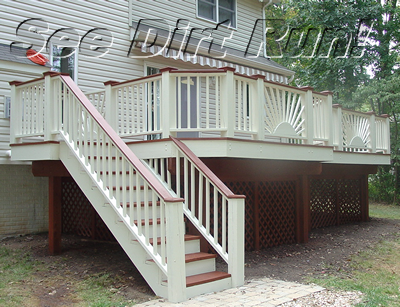 The appearance of a two tone deck is so named because the floor is often one color, or is a semi-transparent tone, while the rail system is a solid color such as white. What it your style of outdoor living? This should be considered if you are thinking about a two tone deck. Many deck owners prefer a single color to provide a natural continuity with their existing style of siding and landscaping design. While there are many choices in colors, the type of finish is always a big factor to consider when choosing a stain. They come in what can be referred to as either toners or semi transparent finishes. This means that they give a little or a lot of color but does not impede the natural look of the wood and its grain from showing through. In other words, similar to the type of look you see in fine wood furniture that is colored to resemble a certain wood species like cherry, oak, or perhaps mahogany. Next there are opaque or solid color stains that will cover the wood like a paint, hiding the woods natural grain. 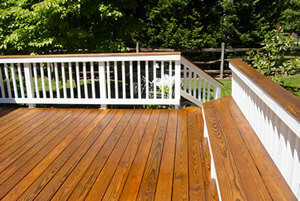 These types of stains give a consistent color throughout the deck and look very rich. 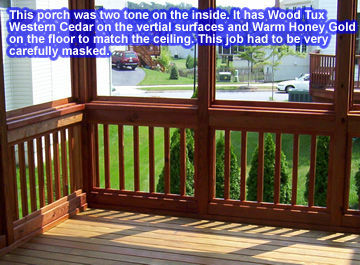 Many deck owners use this type of finish on older decks to help its appearance and possibly cover any flaws in the wood. Two tone decks are becoming increasingly popular. Deck owners enjoy the look of a two tone deck where the railing and deck floor are coated using a combination of the finishes. The most common is the solid color stain on railings and pickets, while the floor is coated with a semi transparent or toner type sealer. The results can be very beautiful and compliment or accent the house and landscaping. While a two tone deck has become popular it’s also done with good reason. The solid color will hide the flaws in the pickets and railing system and last longer on vertical surfaces requiring less maintenance than the flooring does. The semi transparent or toners used on the horizontal surfaces provides the necessary UV protection but since it is understood that these areas require much more maintenance, using these finishes makes maintenance easier and benefits the surface they are applied to. Most semi transparent and toner finishes are oil based. These oils are beneficial to the surfaces which take a beating just from the sun alone, foot traffic, walking, scuffs, scratches and marking from furniture commonly found on many decks. Also the oil based finishes help to provide a barrier against grease spills from BBQ grills making the spots easier to remove when it is time to clean the deck. Consumers also need to be aware of the VOC changes that went into effect in 2005. These changes have had an impact on the coatings industry, and on product performance. These factors combined with EPA recommendations for an effective barrier from CCA exposure and contact makes them a smart choice for any two tone deck project. While the cost for such a project will be higher than a single finish, the benefits are in the savings you’ll have by caring for the horizontal surfaces on a regular basis while the vertical ones only require a light cleaning and occasional touch ups less frequently. Check with your neighborhood Home Owners Association before choosing a two tone deck finish. The HOA can make you remove a finish if it violates any covenant in the HOA agreement. Ask a See Dirt Run!™ Inc. representative about two tone deck finishes when getting an estimate for your deck care needs. Two tone deck sealing and staining and low pressure house washing for vinyl and aluminum siding are limited to parts of Maryland and Northern Virginia. Our service areas include: Montgomery County, Frederick County, Howard County, Carroll County, Prince Georges County, Potomac, North Potomac, Chevy Chase, Wheaton, Tacoma Park, Olney, Rockville, North Bethesda, Bethesda, Garrett Park, Kensington, Columbia, Clarksville, Silver Spring, Laytonsville, Mount Airy, New Market, Ijamsville, Aspen Hill, Gaithersburg, Montgomery Village, Germantown, Darnestown, Poolesville, Frederick, Urbana, Clarksburg, Boyds, Loudon County, Arlington County, Fairfax County, Ashburn, Leesburg, Fairfax, Alexandria, Herndon, McLean, Annandale, Arlington, Barnesville, Beallsville, Brinklow, Brookville, Brunswick, Burtonsville, Cabin John, Chantilly, Colesville, Damascus, Derwood, Falls Church, Glen Echo, Great Falls, Hampstead, Kentlands, New Market, Oakton, Sandy Spring, Spencerville, Sterling, Vienna, Woodbine for decks and fences, gazebos and other exterior wood surfaces.